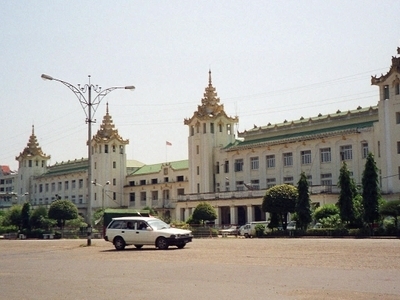 Yangon Central Railway Station located in Downtown Yangon, is the largest railway station in Myanmar. It is the gateway to Myanmar Railways' 3,126-mile (5,031 km) rail network whose reach covers Upper Myanmar (Naypyidaw, Mandalay, Shwebo), upcountry (Myitkyina), Shan hills (Taunggyi, Kalaw) and the Taninthayi coast (Mawlamyine, Ye). The station was first built in 1877 by the British but destroyed by the retreating British in 1943 from advancing Japanese forces. The current station designed in traditional Burmese architectural style, making prominent use of indigenous tiered roofs called pyatthat, was completed in 1954, designed by U Tin. Yangon Central Railway Station was first built in 1877 by the British to support Burma's first railway line, from Yangon to Pyay. The station was located on the southern side of the railway compound on the upper block of Phayre Street (now Pansodan Street) in the downtown area. The building was designed in the British Victorian style and the access roads were bordered by grassy lawns. The beauty of the property prompted locals to praise the new structure as the Fairy Station. Here's the our members favorite photos of "Railway Stations in Yangon". Upload your photo of Yangon Central Railway Station! Hein Pyi is the only Touristlink member to visit Yangon Central Railway Station. Have you been here? Click here to save it.